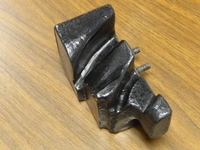 [A] A custom made Polyurethane positioning and holding molded part for holding two different complex curvilinear shaped parts on an overhead conveyor line. [B] A low density but rigid foam platform assembly with a thin hard top surface used for worker height position improvement at assembly lines. 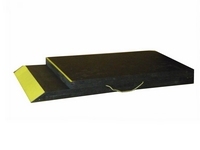 Platform is made specific to the height needed, up to 16 inches, with step up, ramps and tapers as needed for the application. 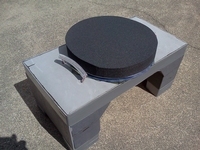 Assemblies weight less than 1.5 pounds per cubic foot of platform volume and can be easily moved and removed as needed. 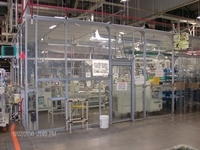 [C] Large scale indoor work area partitioning, in this case using extruded aluminum and woven mesh. Other options are more structural with the use of polycarbonate sheet or corrugated polycarbonate panels. Used to cordon off personal work or training areas, or for more structural applications such as machine guarding and air flow restriction in automotive or other paint departments. [D] A kiting box designed to hold automotive engine assembly parts and which has an integrated aluminum frame and post mount for attachment to the moving assembly at each engine. Used to accumulate assembly parts and keep them close to the locations where they are used. When empty the kit box and integrated line mount will flow down a return flow rack for restocking of parts. 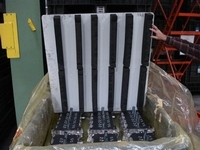 [E] An in plant automotive part transfer tray for flow rack and flat bed dolly transport. 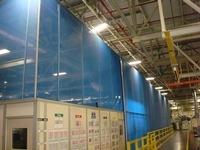 Fabric covered corrugated plastic formed and fitted into a welded aluminum frame. 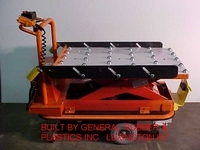 Transfer trays such as this are used to move automotive or other parts from their point of manufacture in a plant to the point where they are installed on a vehicle. 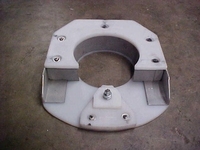 Shaped dunnage and frame sized to specifically fit the part to be conveyed. [F] A kit or tray of machined nylon. Used to accumulate automotive engine assembly parts into a container that moves along with the engine on conveyor line and which returns by way of a flow rack for restock of parts. [G] A complex kiting box container featuring multiple types of parts holding form fit locations and with a containment box made to fit existing assembly line, flow rack and conveyance requirements. 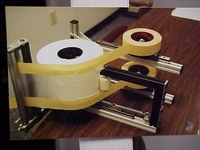 [I] A tape dispensing assembly built to make it easier to join a 4 inch paint masking film with a top and lower adhesive backed masking tape. 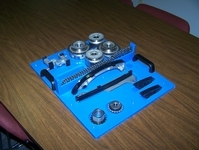 Designed to allow the 3 tapes to be joined at one time as they were being pulled off of the tape roll. Used in an automotive paint masking application. 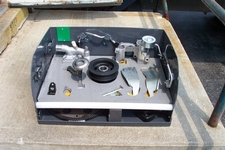 [O] An assembly line conveyance tray for automotive brake and rotor assembly. Specific shape and material specifications to transfer horizontally holding brake assembly part and also to return in a vertical orientation to the start of the line by way of a gravity flow rack. [Q] A very light weight rotating stool assembly used inside a car body to aid personnel in the installation of sun roof units. Developed for ergonomic positioning of team member while installing components. Light weight seat is predominately foam structure but with engineered localized aluminum embedded to add rigidity while limiting weight. It is carried in and out of the vehicle by the team member at the time of sun roof installations. 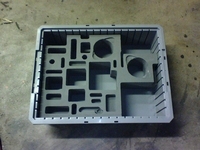 [R] A CNC water jet and CNC router cut hard foam kiting unit inside a standard molded plastic box. 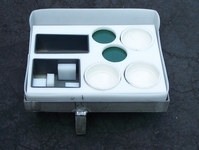 Very close spacing and orientation of slots allow for maximum number of items separated in one stackable container. 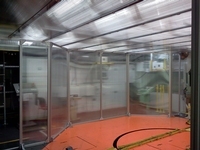 [S] An extruded aluminum framed clean room enclosure with polycarbonate walls and roof. Positive pressure air flow inside and various types of close contact doors allow cleaner, low particulate air inside enclosures in areas with sensitive assembly needs and for quality check and calibration rooms. 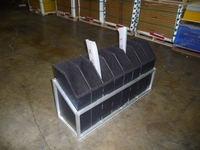 [T] A storage dunnage tray for holding partially finished engine heads in a shipping module. Corrugated plastic tray is CNC cut to fit base of head and allows sequential stacking of parts, separated by integrated hard foam dividers. Made for partially finished engine components as buffer stock storage. 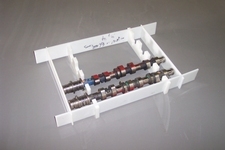 [U] A CNC machined plastic storage tray for buffer stock of engine parts, in this case cam shafts. Used inside molded plastic storage boxes. [V] A combination of two battery powered machines with additional mechanical features developed and added to existing available equipment. Design and modification allowed the unit to transport heavy production parts and to integrate with 3 way horizontal loading/off loading as well as variable height requirements.